The 15th series of Dragons’ Den entered week 4, and another batch of budding entrepreneurs tried their negotiation skills with the Dragons. First out of the lift was Ben ‘Benno’ Muller from Sydney, and Andy Jefferies from the UK. Despite the distance, these two business partners appear to be on to something. With an assured presentation, the boys explained how their company ‘Dock & Bay’ has reinvented the towel. They offered the Dragons a 5% stake for a £75,000 investment. With a revenue of £1.1m and a £330k net profit in the previous year, they were eager to build on their brand of microfibre towels ‘for the intrepid traveller’. I’m struggling to get excited over a towel. At this point, I’m reminded of the wonderful Douglas Adams and his book ‘The Hitch-Hiker’s Guide to the Galaxy’. If that wasn’t written for the intrepid traveller, I don’t know what is. Someone who knew where their towel was, Adams wrote, was clearly someone to be reckoned with. Benno and Andy’s company was initially called Cabana Apparel Limited when it was first registered in February 2015, and became Dock & Bay Ltd in July 2016. The IPO search for a trade mark service shows the boys registered ‘Dock & Bay’ as a UK trade mark in September 2015 and then an international trademark in May this year. Ultimately, it was Deborah who closed the deal by offering the full £75,000 but for an increased stake in the business of 10%. Now that’s someone to be reckoned with. University student Phil Daneshyar, came into the Den with an idea to help people drink more water. Phil’s company Thirsti Ltd used a device called ‘The Puck’ to monitor and report fluid consumption to your smartphone. Looking at the Espacenet bibliography of patents, we can see Phil is listed as a joint inventor of the patented device. Deborah was put off by the need to be reminded to drink water, Peter was put off by the price, and Jenny was not impressed by the apparent impracticality of moving the device from drink to drink. Touker initially liked the idea but as the Dragons pulled out one by one, he declared his concern over Phil’s supplier and also withdrew interest. Next up were Derek Payne and Neville Howes, owners of Dubble Bubble Limited, a company they registered in 2012. 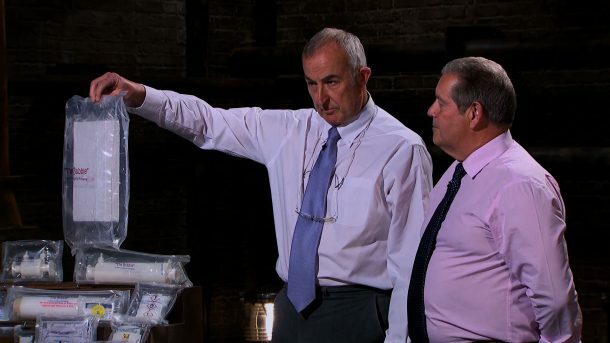 Derek and Neville wanted an investment of £150,000 for a 15% slice of their patented packaging idea ‘The Bubble’. You can view various Dubble Bubble Limited patents on the Espacenet search service. Because their system goes inside a carton. This does away with the carton. They haven’t missed out on a £1m idea, they’ve missed out on a £10m idea. If they make it and they end up being the next Tetra Pak, I’m gonna cry. Keep in touch. Sign up to email updates from this blog, or follow us on Twitter. I'm afraid we don't have any contact details for the entrepreneurs on the show. However, you may be able to contact Dubble Bubble via their website at http://www.dubblebubblepackaging.com/contact-us/.